SCHEDULE A TOUR ANY DAY! Schedule a tour with us and view our diverse housing options and amenities. Find out what makes Prestwick Chase at Saratoga the favorite retirement community for active independents in Upstate New York. Prestwick Chase at Saratoga will be on your right. Located on 120 scenic acres in the foothills of the Adirondacks. Just 5 minutes from downtown Saratoga Springs. Our shuttle bus will take you all over the Capital District, including a day at the races in Saratoga, boat cruises in Lake George, and dining adventures in Albany and beyond! We're A+ rated at the Better Business Bureau. Whether it's Albany, Schenectady, or Troy, you won't find a better retirement community for active independents 55+! Resort living—Enjoy full-service dining, a health spa and unisex salon, putting green, creative arts center & more. Plus friendly hospitality to take care of all your needs! Independent living opportunities through our affordable, maintenance-free senior housing. We have apartments and cottages. Also, guest suites for your company!! Don't take our word for it, schedule a tour any day, on your schedule! The Best Albany Senior Living Community is in Saratoga! Find out why the best Albany retirement community is in Saratoga Springs! 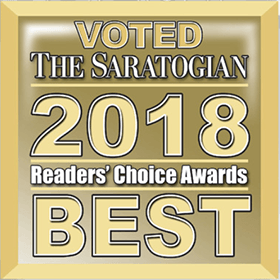 We’re Voted #1 Senior Living in Saratoga! We're voted the best Senior Living in Saratoga Springs by the Saratogian readers! Come see why we're #1 in the Capital Region!